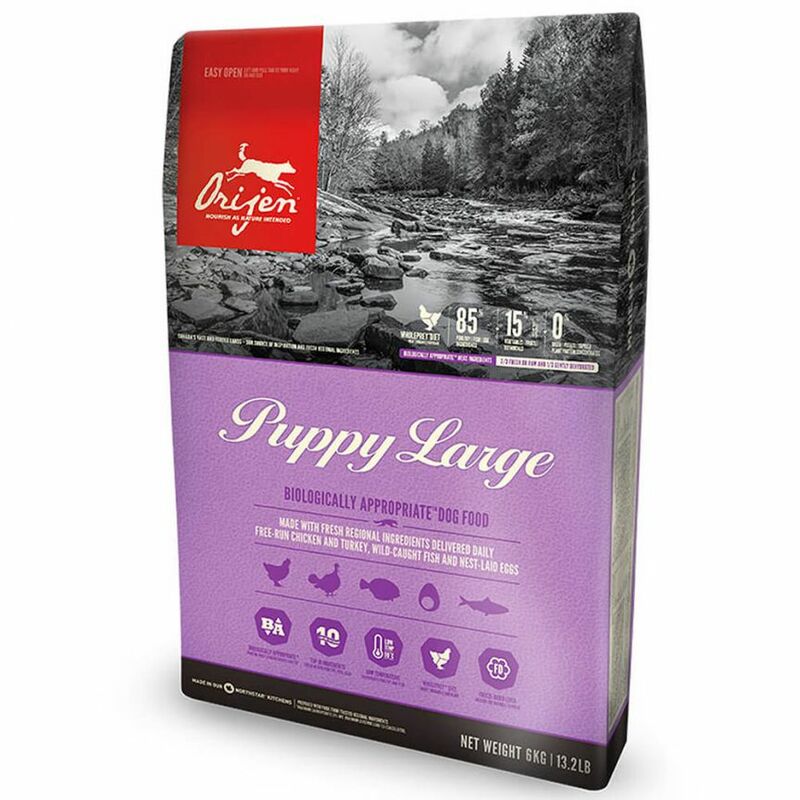 Orijen Large Breed Puppy food is specifically made to support the growth & development of large breed puppies. 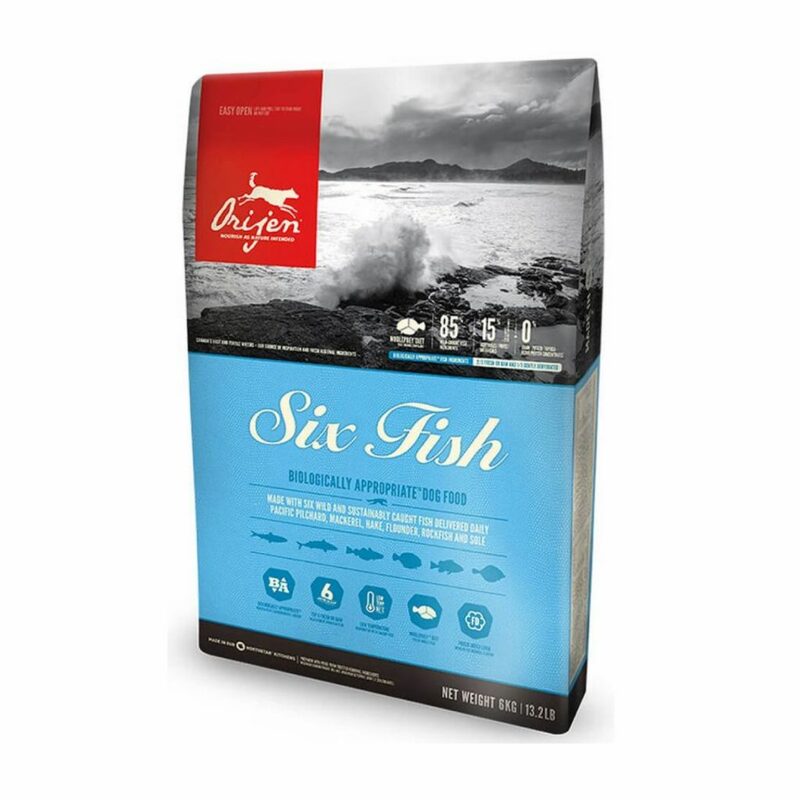 This dry food formula is packed with 85% meat inclusions from 6 different sources, including (regionally sourced) chicken, turkey, flounder, Atlantic mackerel and herring and nest laid eggs. 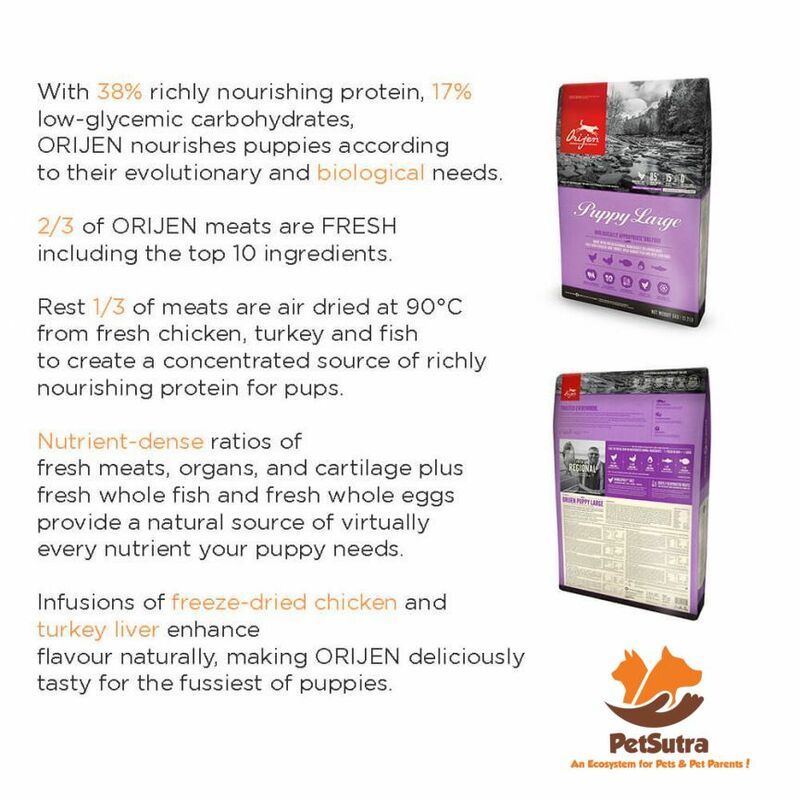 Orijen’s unique Biologically Appropriate recipes are made to suit the evolutionary nutritional requirements of your pet without the addition of any preservatives. 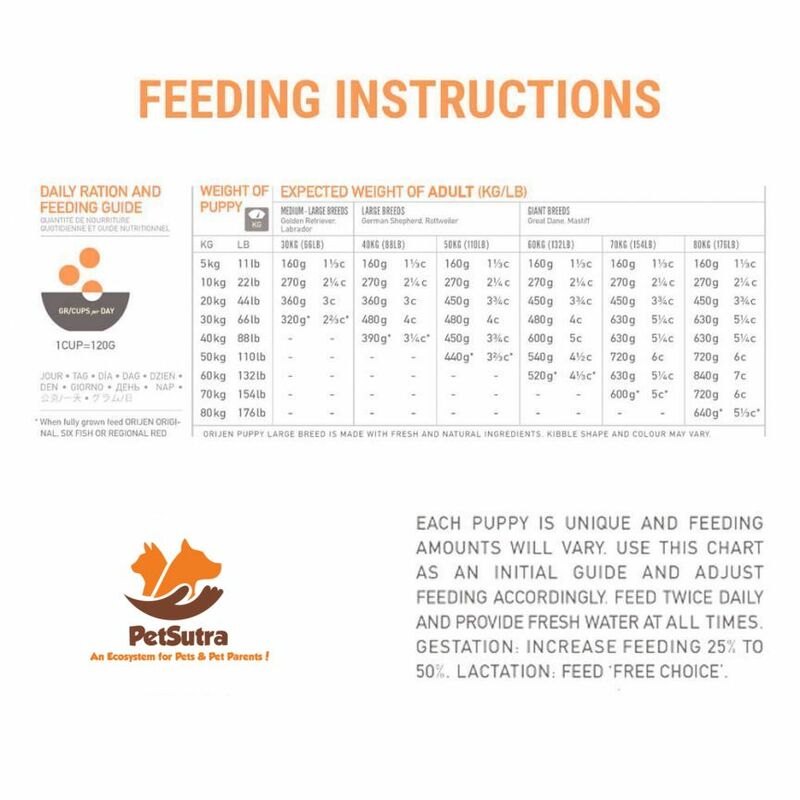 Their award-winning kitchens produce nutrient-dense WholePrey ratios so your puppy gets all the vitamins and minerals from natural sources. The only added supplement is zinc. -- 0% grains, potato, tapioca. 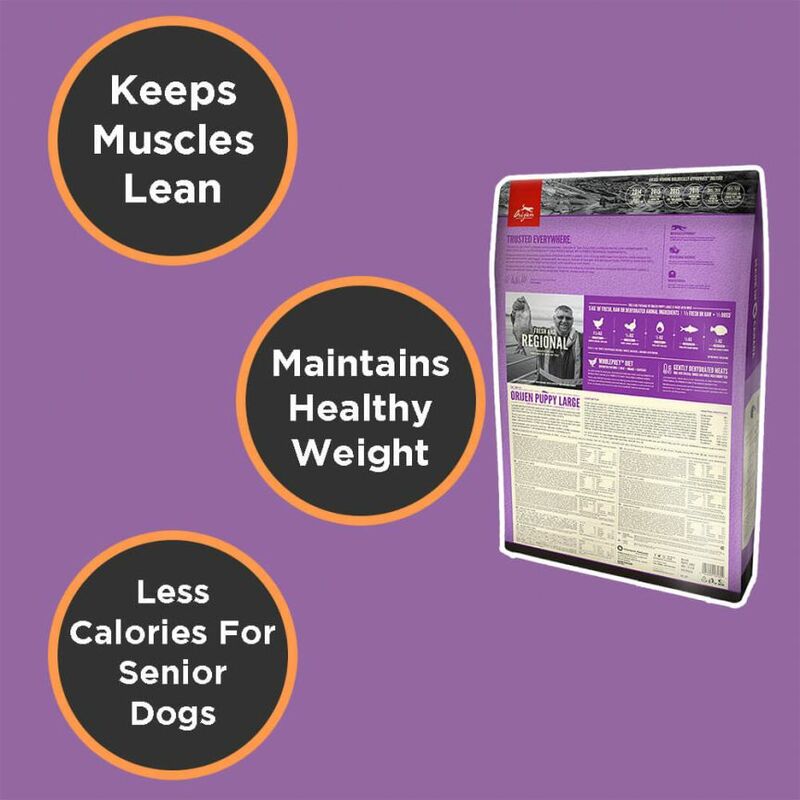 -- 85% Protein content, 15% botanicals. -- Meat inclusions are from 6 different sources. -- 1/3rd of the meat are dehydrated without preservatives. -- 2/3rd of the meat inclusions are fresh or frozen without preservatives. 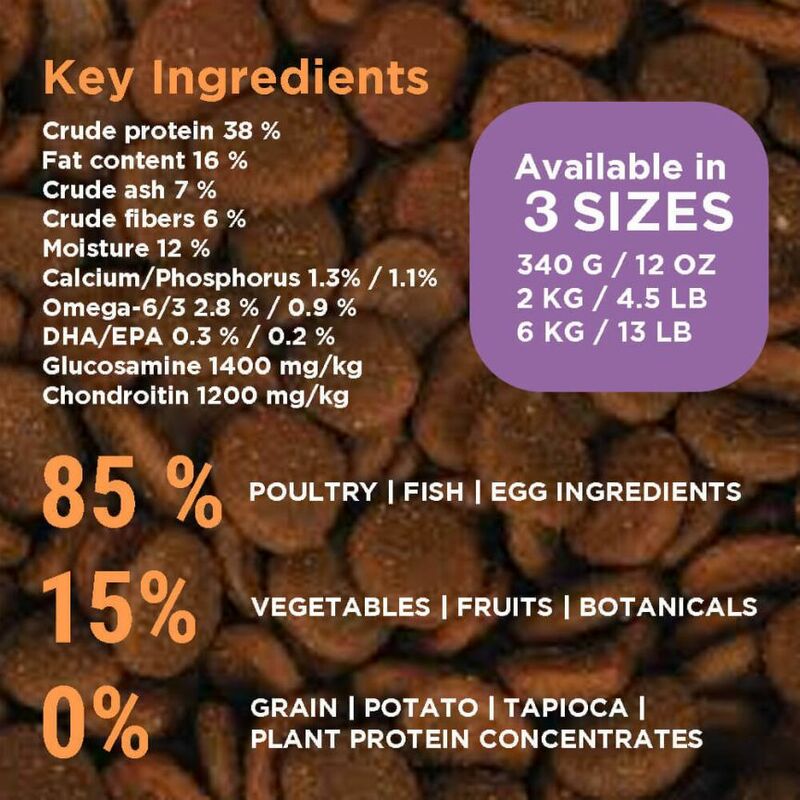 -- Freeze-dried chicken and turkey liver makes this meal palatable. Deboned chicken, deboned turkey, whole eggs, turkey liver, turkey heart, dehydrated turkey, dehydrated mackerel, dehydrated chicken, dehydrated chicken liver, dehydrated turkey liver, chicken heart, chicken liver, whole Atlantic mackerel, whole Atlantic herring, pears, apples, chickpeas, chicken kidney, chicken necks, whole navy beans, chicken cartilage, ground chicken bone, natural chicken flavour, dried kelp, turkey cartilage, chicken fat, whole green peas, collard greens, whole pumpkin, freeze-dried chicken liver, freeze-dried turkey liver, whole carrots, spinach, yellowtail flounder, herring oil, turnip greens, red lentils, mustard greens, pumpkin seeds, pinto beans, juniper berries, althea root, sarsaparilla root, chicory root, green lentils, whole butternut squash, sunflower seeds, lentil fibre, mixed tocopherols (preservative), turmeric, rosehips, zinc proteinate, dried lactobacillus acidophilus fermentation product, dried bifidobacterium animalis fermentation product, dried lactobacillus casei fermentation product.